It has nearly been a decade since the price for a Premium upgrade changed — it went to $24. Premium subscribers themselves have said it’s too cheap. I wanted some detail, and was boggled by what they told me. An astounding 94.5 percent of Premium subscribers — the ones already paying for the expanded issues, so they’ve seen what they’re getting — said I should charge them more. This is no anecdote-based guess: I ran an anonymous survey asking what they would “happily pay” for Premium. I was blown away that more than 1,200 existing Premium subscribers answered the survey — that’s a huge percentage of the subscriber base, and I only gave them a few days to answer. 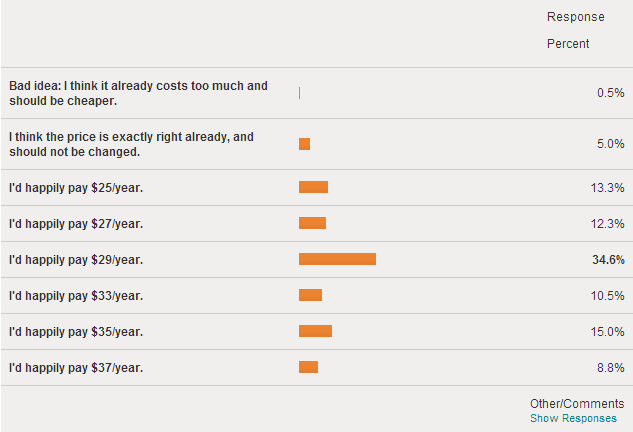 My pre-survey guess was they’d center on $27 year. I was wrong; only 12.3 percent chose $27. The biggest group — at 34.6 percent — responded that they would “happily pay” $29/year. An additional 34.3 percent said they would pay even more than that. Wow: almost 69 percent of those already paying say I should charge at least $29/year because they think the publication is worth it. And that number doesn’t even count the many who didn’t select any of the pre-set options, but rather left everything unchecked and put a different amount in the Comments area. Every one of those suggested $30 or more. Premium subscribers don’t just think the expanded issues are worth the price, they strongly feel their subscriptions are worth much more than the price charged, and almost unanimously support a significant price increase. Just some of the 293 comments. I’ve added a response to a few comments/questions (in parens and blue). Based on a 3% annual increase, you would be at $32.25/yr in 2014. I’m retired, disabled and on a fixed income, but I can afford a few more dollars a year. It’s cheap even at the highest suggested price! I’ve had numerous pay raises since 2004. Why shouldn’t you? Randy, at $24 you have been way too cheap for way too long. $40 is not even $1 an issue. I just NEVER thought I would say this but, come on, raise the price. I’d probably pay $50 a year, actually. I for one plan on being a Premium subscriber for as long as it’s available. Like others, I thank you for being financially transparent. We need more well-run businesses like yours, and we need your unique blend of wit and attitude for many years to come. Thanks for the opportunity to comment. Randy, You do us all a great service, and I for one think that the subscription is very underpriced — I am a librarian and purchase of all the (print and electronic) subscriptions and newsletters for my agency, so I know how much these things usually cost, anywhere from $20.00 (large national mags) to $250.00 (specialty newsletters) per year for a MONTHLY newsletter or electronic journal issue. I’d happily pay up to $52.00 a year because that’s only a buck a week, and I deserve something wonderful for me. True is, simply put, a lifeline that has helped me keep my sanity while working overseas, and since coming home it provides a welcomed, witty relief from the ‘normal’ news. Honestly, until I read this question I thought it was $49 per year. If you don’t make a living, we don’t get True for any price! Actually, I’d pay whatever you charge. I can either raise the price, or work toward shutting down This is True so I can move to something that will pay me more. I’ve not just not had a raise, but I’ve actually been taking pay cuts for most of the five-year economic downturn. Poor me? Not at all: I know many readers are much worse off. But I’m not going to let the publication bankrupt me when I know I can do better. More than 94 percent of the readers in favor of a price increase isn’t a suggestion, it’s a demand that I make sure True continues. It’s rational selfishness: they want it, and understand that in order for me to want to continue to do it, I need to be paid better. So if it takes just $5, or $10, or $15 more for them per year to get what they want, it’s pretty damned smart to offer to pay that. There were significant patterns in the comments: the most-repeated comment was, why didn’t I include any even numbers? Because then there would be too many response options. I’m trying to get a feel for what they want, not an exact dollars-and-cent figure. The second-most-repeated comment: allow subscribers to pay more if they want to — let them choose the price they want to pay over the base rate so they can help to support the publication. Several say they can afford it, and if it helps to keep the price down so more people can upgrade, they’re fine with that. That was another “wow” for me; I’ve heard that many times before, but the call is definitely getting louder. Granted. The third-most-repeated comment: the price should be $30, not $29 — which surprises me in that so many seemed to sense that the responses would center on $29. I do happen to prefer round numbers myself: the True books, for instance, were set (in 1995!) at $11 even, not $10.99, even though it has been proven again and again that the general public sees those as two very different numbers: $10.99 is much less than $11, and thus does result in more sales! I just don’t want to play that game — the “people are stupid so let’s fool them to get a few extra bucks” game. Thus, the Premium subscription rate will rise to $30 on August 11 (that’s the date of Issue #1000). There will still be a discount for two-year terms: $55. The delay gives those who are cost-sensitive a chance to jump in at the 2004 price, and they’ll have a year (or two!) to decide whether they wish to continue at the higher rate. I truly appreciate the amazing support and dedication this shows. Per reader request, the next increase came a little sooner, and it’s now $32/year. I don’t remember when my subscription expires. Just to make sure it doesn’t (and I don’t know if you have or want a way to let us know — talk about a lot of work!) I’m going to be sending you $55 for the next two years as soon as the price goes up. I love this publication and think you definitely deserve a raise! FWIW, I have been a subscriber to Linux Weekly News for some time, and they have always offered multiple tiers — if you were a starving programmer, you could have a break (and I took it a few times); if you were making $120K a year driving a room full of Oracle, you could pay more. They, too, had to add a “ok, whatever you want” tier at the top — for which all you get is that your user number on comment postings is identified as a “*Supporter*” — because people simply would not let them go out of business. Quality, I guess, will out. Glad to read that the majority of people realized just how valuable you and your time is. Not sure when my subscription expires but I figure I will just do a 2 year renewal with some sugar added and live with whatever my new expiry date is. Thank you for everything you put into This is True. Unfortunately I missed the reply window due to work and yes playing on FB but I’m definitely good with you raising the price. I’ve enjoyed both the free and premium editions for years and I’m willing to pay for the premium as long as you are willing to publish it. Your stories have entertained and educated me and for that I thank you sir! Dang it, Randy, now you’re making me feel cheap for getting in there and going premium at the old rate recently. How about a “top up” option (or a “donate” feature in general) on recent subscriptions? I guess I’ll wait until after August 12 to add a year or two to my subscription. To me, 10.99 is more than 11, it means the nuisance of having small change — Japan is a country where they bring that nuisance to the highest level. Many item here (not including weighed products with price per hundred grams) is some odd number — ending in 9,3,7…. It also means I am not sure when you have to spend so much to get a special offer that I have to buy one more thing just because of the total is a tiny amount less than the specified amount. Randy, you should give some general assurance of how the money will be spent such as all stories will be checked for realness. There are two barriers to this: cost, and cost. In addition to taking a percentage of the charge, Paypal also charges a per-transaction fee. Twelve monthly fees rather than one yearly fee adds a noticeable hit. Then there’s administrative cost — tracking the order on this end for accounting purposes, matching it to our system to ensure it’s credited correctly so that your subscription keeps coming (or stops if/when you cancel, or Paypal cancels it automatically because there’s a glitch — and for Paypal, the “glitch” can be something as silly as you updated your credit card expiration date, or changed banks). It’d be great if that was all automated, but we’re too small to pay for that automation — at our level, doing that would be more expensive than paying a human to do the work. It’s great to give my assistant a job, but yes, more work (12 transactions, vs one) is not only more work, but more pay. I know I marked my survey response for an increase, just can’t remember what level I hit. However, since then I was thinking about this a lot, and am not sure when my subscription is due. I think you should go for $35 per year. I’m on a fixed income and if I have the money in PayPal at the time it comes due I’ll happily pay the higher rate, whatever you set. However, if I don’t have the money at that time, I’ll simply drop back to the free issue and bludge off you until I do have the money to pay you — like I did when I first subscribed and first upgraded. Due to my circumstances, PayPal is the only way I can pay you and I can’t link it to a bank account, so I’m dependent on paying you from the money I raise via book sales that go to my PayPal account. I’ll try to keep enough in there to cover the new subscription rate. Thank you for the reply! Wow, I need to pay more attention to the Upgrade section in your emails. The quarterly option completely escaped me. As thick as I can be sometimes, it’s a wonder I haven’t ended up the subject of one of your stories yet. It might be worth including that option in your store, which is where I always end up when I’m considering going Premium. It is of course on your Upgrade page linked from the weekly email, which I just now checked out. Out of habit I typically visit websites directly rather than using the links provided in emails. You’re awesome for including plain links, which I could have copied safely to clipboard and pasted without any tracking or redirection shenanigans. I’ll be signing up straight away. And you did — thanks! It’s not in the shopping cart since there’s no way to do it in the cart — the cart doesn’t ever store credit card numbers (they’re processed by a separate module that is outside the cart’s data base), which is of course for your protection and my peace of mind. Randy, if I ever had the opportunity to take you for coffee, I’d jump at the chance. A couple coffees would cost me at least $6. Since we’ll probably never have that opportunity, I’ll happily pay a little more each year for my True subscription — worth every penny. Keep up the good work. Yep. I’m another one of those on social security, so my funds are limited. Heck, I’m not even sure I’ll have internet when I move next month, so if you don’t see me when it’s time for my subscription to renew, it just means I’m offline. I’ll miss you Randy and This is True until I am back on my feet again. Seems to me that in the option for paying more than the required amount, it should be that if someone is paying 55$ or more they should be bumped to a 2 year subscription, or at least reminded of that option before they pay. I understand some people are able to and interested in spending extra to support this publication, and if I could afford to, I certainly would; but sometimes one may not notice the second option immediately, and a bit of pointing in the right direction may be a good idea. Here it is the spousal unit (Charlie from Missoula MT) who has the subscription and we share it between us. We just now got done discussing this and believe that this publication is worth the higher price you are asking. Thanks Randy, for many years of our entertainment. Thank you for your thought provoking entertainment. I read some of the stories to my 17 year old son just so he’s aware of the stupid decisions people make and the consequences. I want him to learn to make good decisions and This is True is an excellent teaching tool. Amazingly enough he actually listens. I’ve been reading the free subscription for a couple of years now and have been planning to upgrade when I find a job. I’m still unemployed (single mom of two teenagers, no income) but decided to take advantage of the current lower rate. I earned a gift card for doing a focus group and I used that for my payment. I’d like to contribute more and will when I find gainful employment. Soon, I hope. Thanks again Randy. Love your comments on FaceBook too. I expect that your premium subscriber base may well rise substantially AFTER the price increase goes into effect based upon the fact that the current rate is perceived to be ‘too low for the product to be worth buying,’ an odd psych effect which not infrequently results in a good, inexpensive product being ignored in the market. Price increases increase the perceived value. I’d hoped that you could expand your subscriber base sufficiently to cover your proper overhead and profit, perhaps the price increase will result in a subscriber boom also. I do think that you’re wrong to not play the ‘cents’ game. Not as a trick — as you would actually be reducing your price slightly, and it does result in more sales. A couple years ago I purchased a premium subscription for my brother-in-law who was dying of pancreatic cancer. I’m afraid that he only got a couple months of enjoyment from it as he died in three months, but he did enjoy it while he could. I’m going to scrape up enough to renew at the old price (Scotch’s blood, disability fixed income and all.) Too good to let die. 1 – It is fantastic that you are being so open and transparent with your business and pricing model. 2 – I’m sure you are seeing an uptick in renewals. It would be fascinating to see the matrix of how many people subscribed and extended, and what price points they selected. I can’t recall ever seeing anything sold where the purchaser could choose to pay a higher price. I think it’s awesome. 3 – I am always fascinated by your reluctance to price things ending in .99 or .95 — you’ve mentioned it in other posts. Many years ago when I owned a retail lab, we installed new price boards and I decided to raise prices from $4.99 ($8.95, $10.98, etc.) to even numbers — $5.00, ($9.00, $11.00, etc.). Ancillary item sales plummeted. But instead of going back down by 1¢, I went up by 95-99¢. Sales soared! My takeaway on this? My customers told me — in no uncertain terms — that they would much rather have pricing end in 99¢ than in even dollar amounts. You describe it as “people are stupid so let’s fool them to get a few extra bucks” and I remember thinking along the lines of “people tell me what they want so I’m the stupid one” if I don’t give it to them. I know we will never agree on this point. But IMHO you do yourself and your family a financial disservice by your reticence to accept and embrace the proven fact that people prefer buying things with pricing that ends in high cents. I suppose you’ll say that nobody forced them to choose an answer that included the term “happily pay”, and that’s true, but refusing to name an amount because they didn’t agree with the term you used would prevent them from having any input at all. Kind of a “damned if you do and damned if you don’t” sort of thing. I’m not saying that *none* of your readers would “happily pay” more — clearly there *are* those who feel that way. But you don’t really know what percentage that is since there was no other option given. I already have my own subscription, as well as one I give to a friend, who desperately needs something to make her smile. I believe I shall be adding an additional one this year, and leave it up to you to either apply to True’s cost, or surprise some lucky non-premium reader. Dealer’s choice, and thank you for the many years of thought provoking, delightfully intelligent reporting. It has been a joy and an honor to take this journey knowing you are working so hard to make it better. You are truly gifted with words, and it is a pleasure to help support True’s continued publication.